See and read about the newest rock climbing harnesses from Beal, Black Diamond, CAMP, Edelrid, Edelweiss, Grivel, Misty Mountain and Wild Country. Pictures, words, and video come from the Outdoor Retailer trade show held in Salt Lake City, UT. A comfortable sport climbing harness with a wide belt to support the back. 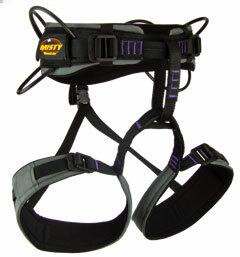 A light harness that maintains the comfort of much heavier harness. The Phantom uses the laminated Web Core technology (a single piece of wide webbing, laser-cut in the shape of the swami and leg loops versus a narrow webbing for structure with wide padding for comfort), one waist buckle, and fixed leg loops. They’ve also added ventilation holes to the swami and legs. It comes in four sizes and will retail for $69.95. The men’s, women’s, and kid’s version all have the same features: Two buckles on the waist and a dynamic fit system with two plastic buckles (slide to adjust, simple and effective) on the legs. The buckles stay in place with no slippage and since they’re plastic they weigh and cost less than metal buckles. Although they utilize the same laser-cut webbing as the original Web Core technology, the outer fabric is sewn to the inner webbing instead of laminated. This reduces the price while maintaining much of the same performance. At $60 it’s one of the cheapest 4-buckle harness offerings. Addict/Amazon: $59.95, Rookie: $49.95. The Solution sports fixed leg loops and a single speed buckle on the waist. The new offering here is the Fusion Comfort technology, which is a lamination process with three structural bands that distribute the load effectively while staying soft and pliable. The Solution harness is wide on the sides where most pressure gets concentrated and narrow in the back to save weight without limiting support. The wide legs are designed to be supportive and comfortable. It’s low profile makes it easy to pack down in size. The female version has a slightly larger rise and adjusted geometry. Available in January 2016 for $69. 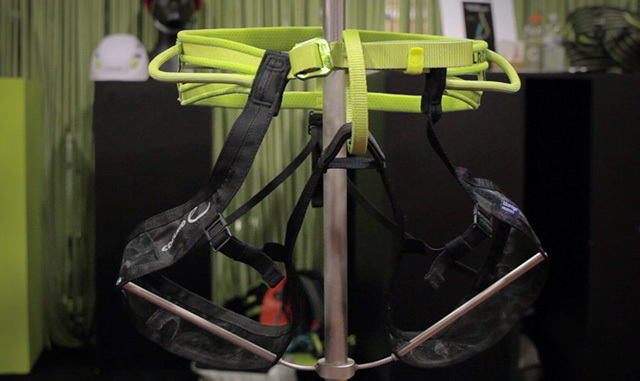 Coming in at 236 grams the Flash is expected to be the lightest sport climbing specific harness on the market. [Click to see every harness available today, sorted by weight]. CAMP is using a new laminate construction of webbing that is very supportive and lightweight. You can see a white strip throughout the entire harness and this is the main body structure that the harness is built on. CAMP has then woven each individual structural strand of webbing through that body making the laminate integrate with the structure of the harness. On the inside of the harness there is 3 millimeter of honeycomb foam laminated onto the structure to increase comfort. The leg loops are fixed and there is a single quick adjust buckle on the waist. All the tie-in points are reinforced for durability in high abrasion areas. There are two different styles of gear loops. The front gear loops are molded flat for racking lots of draws and the back gear loops are rounded for utility things like belay devices and locking carabiners. Coming in sizes XS, S, M, L, XL at $79.95. Named after one of the tallest mountains in South America (Peru to be exact), the Huascaran (wa-skuh-ron) is the world’s first bluesign® certified harness, which essentially means it will be the most eco-friendly harness. It contains over 95% of bluesign® certified materials and the whole production process is bluesign® certified also. This is far more stringent than gear that is just made with bluesign® fabric. The only part of the Huascaran harness that is not bluesign® certified are the buckle and that’s because bluesign® doesn’t have a standard to certify them. It packs down incredibly small, yet it was designed with comfort in mind. The split webbing design provides maximum breathability while the structural elements ensure it holds it’s shape. It weighs in at 220 grams, has easy to open clip buckles on the leg loops and a waist buckle that can be unthreaded quickly and easily so you don’t have to remove crampons or skis to put it on. Available in Jan./Feb. 2016 for $59.95. The Finn Light harness is a laminated, fully-featured adult-like harness. Yet it also takes into consideration the proportions of children and isn’t just a “shrunk” version of an adult harness. 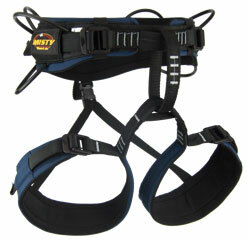 The main focus with this harness was ensuring any kid could easily put on the harness without assistance. To do this Edelrid added easy glide buckles made from high-grade aluminum (smoother) and the leg loops are easy to put on because there’s a piece of elastic between them ensuring they won’t tangle in a backpack – pull it out and they just fall right into place. The Finn Light can be worn as soon as the waist belt fits (though it never hurts to double check the size chart). There is no weight maximum. The harness is lightweight (partly due to it’s size) yet comfortable because of the wider leg loops and the mesh insert. Available Jan./Feb. 2016 for $42.95. The Zack harness fits a huge range of sizes, so it could be used for multiple people, or it would be an awesome harness to have in your arsenal to take friends climbing. 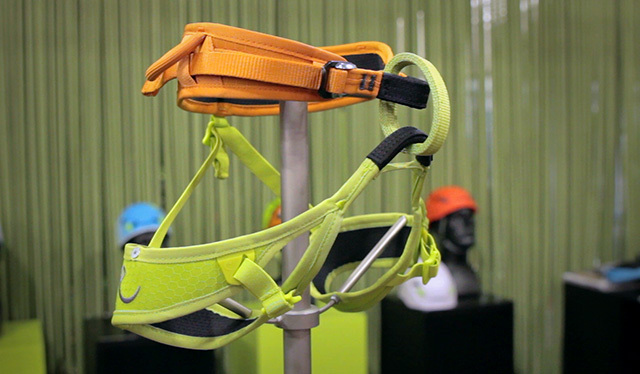 Although it comes in at $50, which will make it appealing to newer climbers, it’s still a fully featured harness. [Click here to check out all the harnesses available available today sorted by price]. The load bearing webbing freely flows through the waist belt and allows a very wide size adjustment. At max adjustment the medium can look like an XL. Yet, whether it’s adjusted to the minimum or maximum size, the gear loops and belay loop are always centered since the webbing can move freely to center the harness. This is not a typical feature for most harnesses and produces the same end-result of having a two-buckle adjustment on the waist. The all-aluminum buckles will increase durability versus plastic buckles found on many price point harnesses. The super strong and durable gear loops increase safety: The gear loops are one big piece of webbing with very strong end-points so even with significant force applied to them, the gear loops won’t rip off. Available in January for $49.95. Four buckles for size adjustability and use in all conditions from sport climbing to alpine. It has four gear loops and uses “Web Core” technology (a single piece of wide webbing, laser-cut in the shape of the swami and leg loops). This makes it light, incredibly compact, and eliminates hot spots often experienced in harnesses that utilize narrow structural webbing. The price is more affordable because Edelweiss uses stitching instead of the more expensive high-pressure gluing (lamination) process found on their flagship harnesses. Coming out at $49.95. The Shield is an accessory that promises to alleviate back pain and to help prevent injury for people who use harnesses a lot. Designed for big wall climbers and folks who find themselves in a lot of hanging belays like new routers, route-setters and photographers. The Shield is made of a soft, spongy rubber with a hard plastic back plate. The rubber dissipates the energy across the wide area. Stevie Haston demonstrated the Shield’s capabilities (see min 8:41 on the video at the top of this post or here’s the queued link to YouTube) by dropping an iron ball onto the Shield and the ball simply went “thud” without bouncing. When dropped on any other surface it bounced all over the place. You’ll be able to buy the Shield with a Grivel harness or separately to use on your own harness. Thanks to the simple Velcro attachment it fits on most harnesses and is fast to put on and take off. It’s $35 if you buy it separately and about half price if you buy it with one of Grivel’s harnesses (click to learn about Grivel’s harness: the Ares, Apollo and Poseidon). Misty Mountain wants to give you more options! Specifically, in color. For example, the Cadillac quick adjust and double back versions will now be a smokey gray with purple tacks for the ladies. Which, as a lady, I must say this is a nice way to appease both the “I love purple!” and the “I’m sick of the pink and purple take-over” factions. 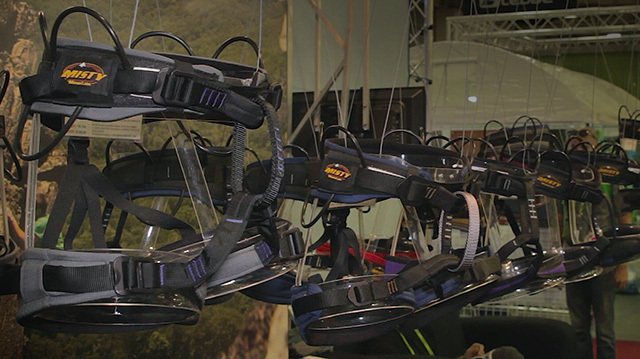 Misty Mountain is also investing heavily in process improvements that will allow them to spend more time researching and designing new gear and enable them to ship harnesses faster. Which, if you’re requesting custom dimensions or colors will be particularly fantastic. Edit: More Misty Mountain harness photos thanks to Dave’s request in the comments. The load distribution of the Mission harness is very unique. Wild Country uses a V-Flex™ structural belt design and “Dura-Weave” construction that looks like basket weave. Wild Country has the belt webbing separate and become the supportive top and bottom of the swami while the majority of the harness is a durable weave that stretches in every direction. This happens on the waist and the leg loops. The waist and leg buckles allow for quick adjustment. And there are two ice clipper slots. 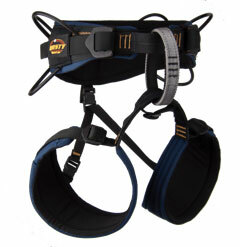 The Mission harness aims to be comfortable and breathable, without foam. The back has an aggressive and anatomical taper to reduce weight and add maneuverability. The men’s and women’s models have different size profiles. Men’s medium is 428 grams, Women’s Small (the middle size) is 419 grams. Coming out at $94.95. In addition to all of the features and construction found on the Mission harness, the Syncro comes with 2 waist buckles to ensure a centered fit. There’s also an extra gear loop per side; Including the combo haul/gear loop on the back, the Synco sports 7 gear loops. The use of the Dura-Weave material and their load distribution keeps it minimal yet still aims for a comfortable and breathable fit. This beefier version, compared to the Mission, is meant for longer multi-pitch climbing and adds comfort during hanging belays. Coming out at $109.95. Any additional photos of the 2016 line up from Misty Mountain? Great question Dave! We don’t personally have any better shots but we’ve sent a note off to Misty and will let you know when we hear back. Just got some photos back from Misty today! You’ll see the blog has 5 more photos, including the Men’s Cadillac (quick adjust and double buckle), Women’s Cadillac, Volt, and Titan.